We do not often find ourselves jogging the same track as the redoubtable Dennis Gartman who commands untold premiums for his advice, but now, it seems, he is verifying our suspicion of two days ago (Please see “Gold’s waterfall drop might be associated with the big drop in British sterling”) that something is amiss in London gold trading circles. 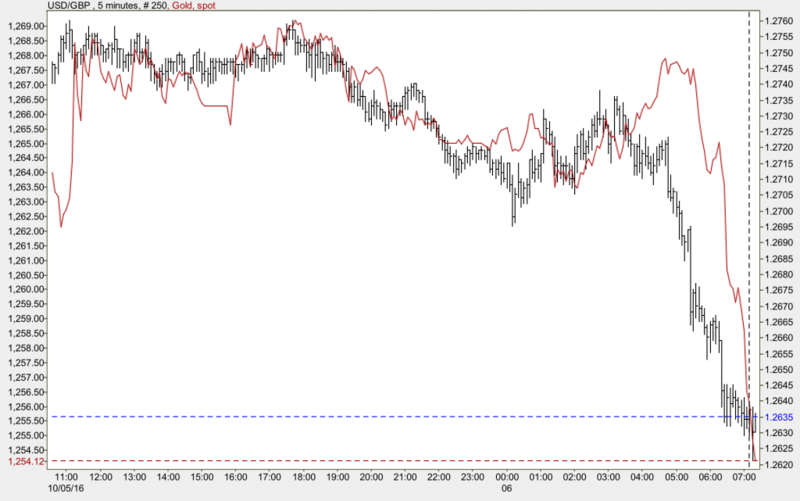 Here today’s chart – a second waterfall move in the gold market coincident with a second swan dive for the pound and Gartman’s take (snipped from ZeroHedge). My first instinct was that the paper gold liquidations in London “could be part of a scramble for liquidity among big banks.” Gartman blames it on one “massive” hedge fund. . . .Don’t know if he has an inside track on that or an educated guess, but for now we will stick with “the banks” – more precisely the trading banks who were long the metal on paper up until now. Another waterfall later, it looks like the Gartman’s culprit should be pluralized, unless the single fund’s positions are so deep that it will need more than one trading session to get liquid. But that doesn’t make a lot of sense, not does it speak highly of the fund’s chief trader, it is indeed some big fund doing the damage. We may find out the details at some point down the road, but it is doubtful. Stuff hidden in the bushes in London tends to stay in the bushes unless something forces it out. Meanwhile, as the World Gold Council reports this morning, China is out of the game for the week on holiday so gold’s standing buyer won’t be back in the game until next week. When they get back, it they sense opportunity, they will use this downside and put a call on the market for more physical metal. If that happens, we could get a quick reversal. As we have reported here copiously there still isn’t that much physical metal available to meet the demand and the buy orders won’t be met if the price is not high enough. We go along with the World Gold Council and others who have deemed the current situation a buying opportunity, particularly for physical buyers who can weather any further downside. In the past snapback rallies under similar conditions have been sharp and robust. We can report strong volumes at USAGOLD in both gold and silver over the past few days, not at best-of-the-year level reported by some of our British counterparts, but notable nevertheless. Then again, Americans are not as directly affected but they know attractive pricing when they see it.